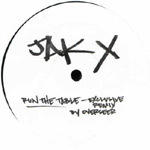 Promotional vinyl with remixes from the PS2 game, Jak X: Combat Racing. Original producer anonymous on tracks 1 &2, Billy Howerdel of A Perfect Circle fame on track 3. Remixes by Overseer (track 1); El-P (2); John Digweed (3).